Want to learn the basics of video editing? You’ve come to the right place! In this 43 minute class, David will show you everything you need to know in order to edit with iMovie. We’ll start off showing you how to import and organize your footage and then we’ll cover topics like adding transitions, adding text to your video, animate your photos by adding “the Ken Burns effect” to them, and so much more. http://www.jfl-media.com/en/wp-content/uploads/2018/06/PVAoh1.jpg 180 320 Christian Bourassa http://www.jfl-media.com/en/wp-content/uploads/2018/12/training-adobe-corporate-media.png Christian Bourassa2018-06-15 21:08:332018-06-15 21:08:33iMovie 2018 FULL CLASS!!! Dude that’s an awesome tutorial! We’ve been using Adobe for years, and now we’re not doing that anymore and this looks like a super viable option! Thank you! Thanks for the well explained tutorial!!! I really enjoyed your video. I have been using iMovie for about 9 months now. I am a convert from Windows Movie Maker. I knew of many of the tools you reviewed in this video, but I also learned a lot of new techniques. I also learned that I need to start taking more video to be inserted with the still photos. Thanks again. i will subscribe. Extremely thorough walk through. Question though about splitting the video clips…does this action of splitting the clips destroy the original video file? Thank you SO much! I had fun making some short videos! If I could like this video 100 times I would. Hi. Thank you for all the good information. I’m starting my YouTube page and I just bought my first MAC computer and I have an iPhone. So I’m going to use all the information you provided here in your video to get started. Thanks again. Can you watch this video, without looking at this guy’s eyes? No, I do not think you can. This was very helpful. I’ll undoubtably revisit as I work on my clips. Thanks. Damn, you can do all this on iMovie? Whats the the point of final cut lol? please please make a video for iMovie using an iPhone. Awesome information video David……I have just one question, Is there a way to input more transitions/Backgrounds, or filters in Imovie? Nice but it’s far from beying "Full Tutorial". Do you intend to cover some more advanced functions in the future? How do I change video to use 16:9 format to get rid of the black bars in the video if possible? From Spain. I’ve just watched your tutorial and I do think it is fantastic. I have enjoyed it and learned a lot from it. Thank you very much. By the way, your English is very easy to understand (and, I can assure you that that is something non-English speakers appreciate when watching videos in Youtube). Please, keep up with such a good work. A small question. If I break up a scene so I can use the Ken Burns effect as a transition, how do I capture the final cropped rectangle so the next scene is cropped to match the end of the previous scene? BTW–your’s are the best tutorials. Really. I have saved my project twice and I must be doing something really wrong 😮 as I added a voice over above a music background and a sound effect. The two times I see the project finished the sound is cut 🙁 sos help, maybe you know what I do wrong: from an imovie beginner dummy practioner 😉 Thank you! He is so cute. I love his eyes. David, you crack me up…love the comment on lack of direct flights from Boston to Palm Springs! Made me laugh! Thank you so much! 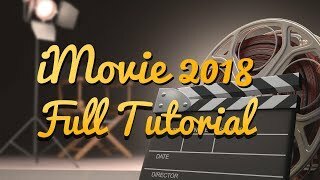 This video is super helpful – just got a Mac and working with iMovie for a new YouTube channel…again, really appreciate the tips and tricks!!! David what do you do when the audio plays and not the video ? I’ve moved the footage to the media bin . It will not however play in the box to the right. Makes it impossible to edit. I’ve done something wrong. Thank you for any insights. SO. SO. GLAD. FOR. THIS. VIDEO. thank you SO much!!!! Fantastic!!! Thank you so very much! Thanks fro such a comprehensive video. I’m new to iMovie. There seem to be black background on all my images when I create the slide. I cant seem to get rid of it. I’ve done a few searches on the apple website and it may have something to do with the sizes of my images not conforming to iMovies required size so iMovie fills in with the black. How can I add a white background instead and or how can i resize the images to fit without the background added? Any suggestion? Thanks for a great beginner like me. I’m heading to Greece and Portugal the end of June and plan on sending "Beginner VLOGS" home to family and friends. I’ll be using my Canon GX7Mark II, DJI Spark Drone,….I’ll be reviewing this before my final in June. Ive searched for hours and was extremely happy to come across your video!! New subbie and thanks a million! !